To help take some of the sting out of tax day 2019, restaurants and other businesses are offering tax day deals and freebies. Tax Day is Monday, April 15th. Check for specific days of each deal below. These are national deals. Some may not be in your location. Great American Cookies: Get a free Original Chocolate Chip Cookie on April 15. No purchase required. Kona Ice: April 15th is Chill Out Day. Get a free ice from participating Kona Ice trucks. You’ll be able to find a list of participating trucks by zip code on Kona Ice’s website. 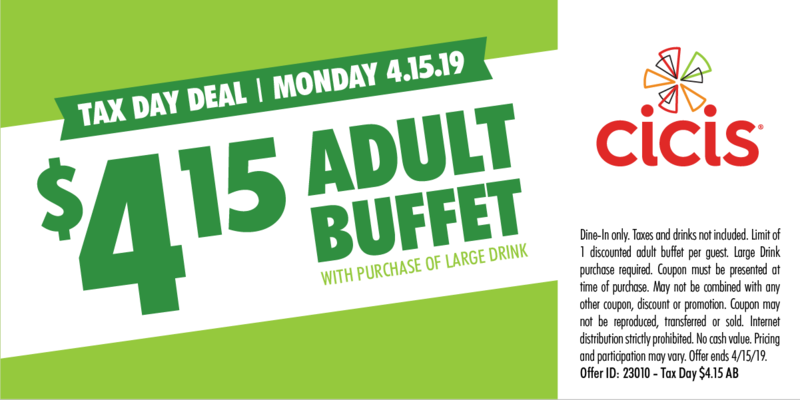 Cicis: On April 15, get an adult buffet for $4.15 with the purchase of a large drink. You’ll need this coupon. Applebee’s: All April get a Strawberry Dollarita for $1. 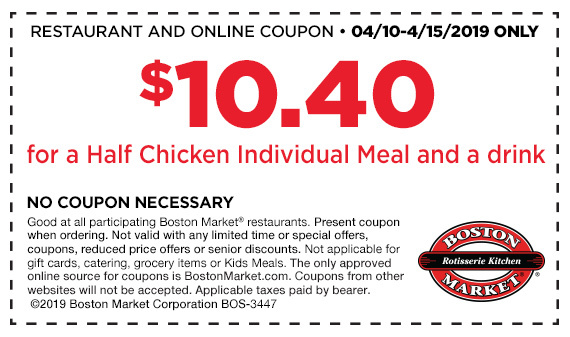 Boston Market: Half chicken individual meal and a drink for $10.40 from April 10 to April 15. coupon necessary. BJ’s Restaurant & Brewhouse: Get 50% off any large Deep Dish or Tavern-Cut Pizza, available for dining in, take-out, or delivery. And Tax Day signals a three-week special of free delivery and no service fee on delivery through bjsrestaurants.com . The offer ends May 5. Dunkin’: Dunkin’ (Dunkin Donuts) is offering its DD Perks® Rewards Members a Medium Hot or Iced Coffee for $1 all day, Monday, April 15 at participating Dunkin’ restaurants. Hooters: Kids at free on April 12 to 15, 2019 with a $15 adult purchase at participating Hooters locations. Bruegger’s Bagels: Through April 15, get a Big Bagel Bundle for $10.40. That includes 13 bagels and 2 tubs of cream cheese. You need to join Bruegger’s Bagels Inner Circle loyalty club to take advantage of this offer. Noodles & Company: NoodlesREWARDS guests get $4 off orders of $10 for Tax Day when they skip the restaurant line by ordering online or through the mobile app with a click of a button. Guests can take advantage of the deal from April 10 to April 15, and must be signed up for NoodlesREWARDS by April 9 in order to receive the offer. 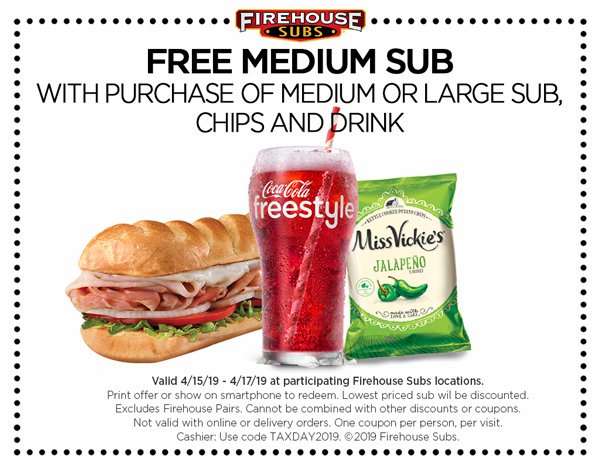 Firehouse Subs: When guests purchase a full price large or medium sub April 15-17, chips and a drink, they get a free medium sub. In honor of Tax Day, BurgerFi will be celebrating with $4.15 BurgerFi double Cheeseburgers on Monday, April 15. One cheeseburger per person (premium toppings will have an upcharge). Guests can take advantage of the offer when they download the BurgerFi app: https://burgerfi.com/rewards/ . Offer valid in the app only. Planet Fitness: From April 11-20, members and non-members can use available HydroMassage chairs for free. Look for a coupon, which will be available starting April 11th. Office Depot and Office Max: 5 pounds free of in-store shredding. You’ll need this coupon. While you’re here on Triangle on the Cheap, maybe you’d like to know about some of the free events coming up.